Bumblebees are bigger than honey bees. And because of their bulky appearance and deep buzzing noise, they’re often thought to be hostile and dangerous. But is there any truth to this? Are bumblebees aggressive? How aggressive are bumblebees anyway? The short answer? Not that much. 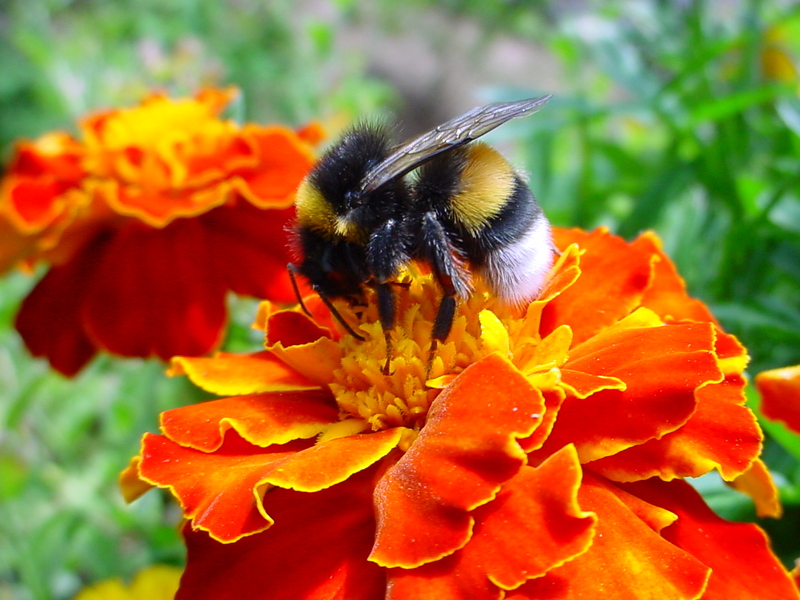 Bumblebees are generally non-aggressive, so they’re not known to attack people. A busy bumblebee looking for flowers wouldn’t go out of its way to sting an animal or a person just out of sheer animosity. With its passive nature, some experts would even say that bumblebees are gentle and that they’re way below honey bees, hornets and yellow jackets when it comes to tendencies of being violent. However, this doesn’t mean that bumblebees won’t ever sting you. Rather than being aggressive, they’re defensive, only attacking when provoked or when their nest is disturbed. Additionally, aggressiveness is also dependent on the type of bumblebee that you’re dealing with. In the kingdom of these fuzzy bees, there is a specific species that’s a little more violent than the others. The Bombus hypnorum or the New Garden Bumblebee has a fierier attitude. Their workers have been observed to habitually attack each other through biting, and their drones are more ferocious at guarding their nest. You can recognize them through their dark orange marking and white ‘tail’. Like most bees, bumblebees can sting. However, only the queen and her workers have this defensive ability. The rest are completely st­­ingless. Bumblebee stingers are less coarse with no extra hooks or barbs protruding on the edges. It’s a kind of stinger that doesn’t latch on to the skin, so it doesn’t get left behind when it’s used. This permits the bumblebees multiple stings without injuring itself. Their stinger is also a stark contrast to the ones found in honey bees. Honey bee species have microscopic barbs at the end of their needle-like appendages. These grip the skin so tightly that they can cause death after the sting. The honey bee would often rip its abdomen apart in an attempt to free its stinger. We covered this topic in greater detail here. So now that you know how a bumblebee generally defends itself. It’s time to learn how to avoid being the recipient of this bee’s painful wrath in the first place. Keep calm. As we mentioned previously, they won’t deliberately attack if you don’t do anything to them. Don’t wear a strong scent. Bees rely on odors for communication, and they are attracted to certain scents. Perfumes and body sprays confuse them and may lead them to hover towards you. Hair sprays, lotions, shampoos, detergents may also do this. Wear white. This may seem a bit odd. But since bees are very sensitive to color, wearing neutral shades won’t attract them to you. Look for little yellow circles on the ground. Many of these bees live underground. So stay away from a bulging pile of dirt and little yellow round things on the ground. When you’ve accidentally stepped on a nest, move away as fast as you can. The bees won’t hesitate to sting you fast. Why not beat them to the punch and run? Don’t swat the bees. Just concentrate on running. Having time to swat the bees means having less time to concentrate on getting away fast. Cover your head. Take off extra layers from your clothing to cover your head. These will keep some of the stingers out. So let’s recall what we’ve learned. Are bumblebees aggressive? No, they’re not. However, they will still attack you if they feel threatened. So it’s best to leave them alone and not do anything to them if they’re not doing anything to you.